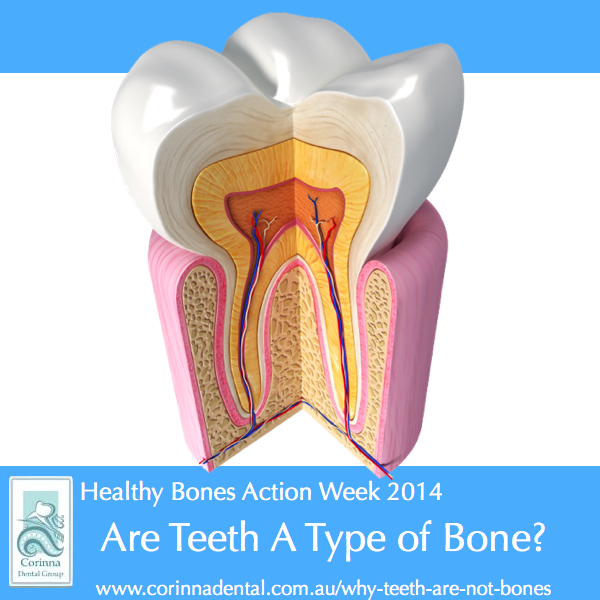 Today until the 10th of August is Healthy Bones Action Week 2014. Did you know that whilst your teeth contain the hardest substance in the human body —the enamel—they are not considered bones? Teeth, like bones, contain calcium, phosphorus, and other minerals. But there’s one substance that teeth don’t have—collagen. Collagen is a type of protein, considered as “the glue that holds the body together”. Unlike a broken bone, a broken tooth cannot mend itself. This is because teeth do not have regenerative powers like bones have. The cells that form the enamel in a developing tooth disappear when the new tooth emerges (erupts) from the gum. This means that if enamel is chipped, cracked or dissolves from constant acid attack, it can’t be regrown.